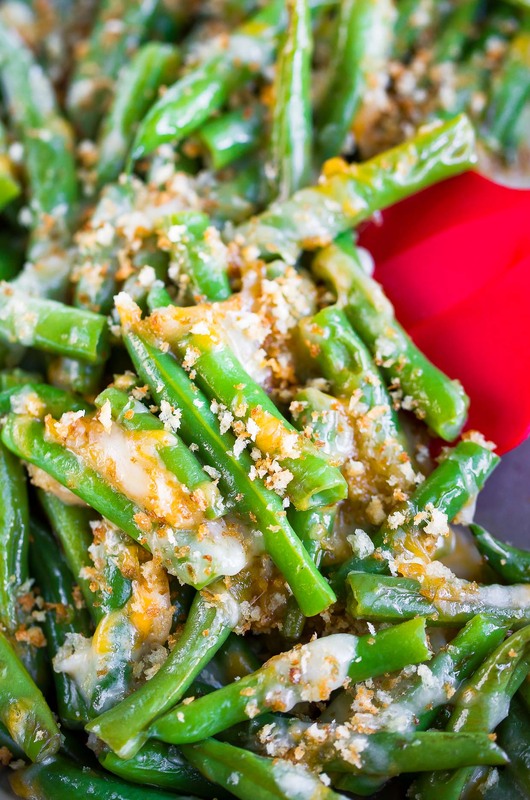 These cheesy green beans are a quick, easy, and totally delicious side dish! Whip them up to pair with your favorite fast and flavorful main course and say hello to a speedy weeknight dinner! It’s no secret that I’m ga-ga for green beans! Not only are they one of the first veggies I fell hopelessly in love with as a kiddo (I’ll legit eat them cold from a can… the obsession runs deep) but they’re one of my favorite veggies as an adult! They’ve even made quite a few cameos on this little blog of mine. I’ve tossed them into salads, smothered them in Sriracha, and swirled them into casseroles galore. This time around they’re getting the comfort food treatment and mingling with a medley of garlic, panko, and cheese glorious cheese! Since Thanksgiving is right around the corner, I thought now would be the perfect time to share this easy cheesy recipe! Since it’s made entirely on the stove top in a skillet, you won’t have to compete for precious oven space. You can even save extra time by blanching your green beans ahead of time. Simply shock them with an ice bath after boiling to halt the cooking process, drain, and pop in the fridge for later. When you’re ready to make the dish, all you’ll have to do is sauté them up with the butter and garlic then add your cheese, salt and pepper, and panko. If you cook them til al-dente where they still have a bit of crunch/snap to them they’re also amazing the next day! I scarfed some of the leftovers warmed up along with some sour cream and chive mashed potatoes and LOVED IT! 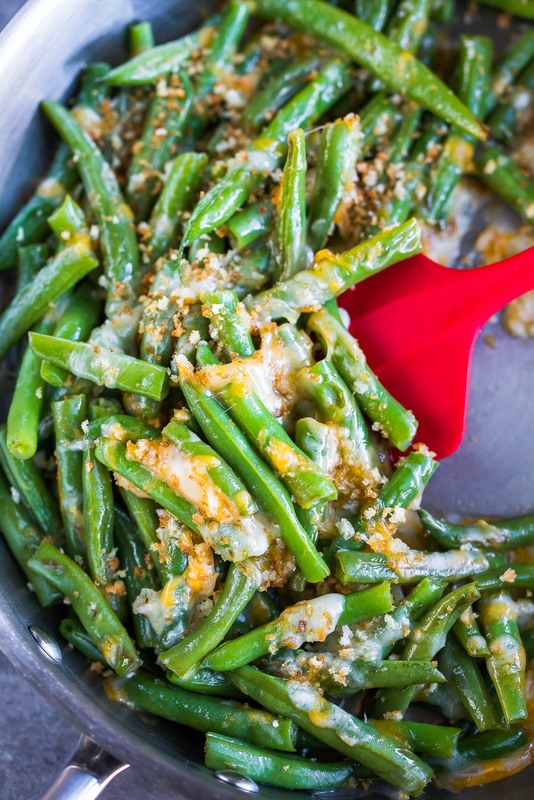 These cheesy green beans are a quick, easy, and totally delicious side dish! Trim and clean your green beans with kitchen scissors. Cut each in half. Place green beans into a large skillet and cover with water; bring to a boil. Reduce heat to medium and simmer until beans start to soften, about 4-5 minutes. While your green beans simmer, heat a small pan and toast your panko until golden brown, shaking and stirring the pan a few times to prevent burning. Once it starts to brown, remove from heat. Drain green beans in a colander and return to the pan. Add butter and cook on medium heat for approx. 4-5 minutes or until desired tenderness is reached. Cook them less for al dente and more for softer beans. Add the garlic towards the end and cook until fragrant and soft. Season with salt and pepper and mix well. Top with cheese and cover pan with a lid if you have one (to get everything all hot and melty!) then top with toasted panko and dive in while it's hot! Looking for a little somethin' extra here? I'm super in love with adding 1/8-1/4 tsp ground cayenne pepper to the mix for a little heat. Feel free to follow suit if you're a fan of spice! 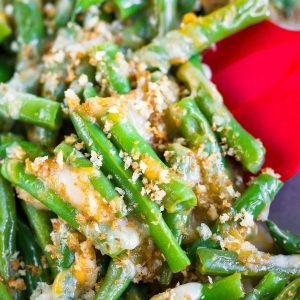 If you get a chance to try these easy cheesy green beans, let me know! Leave me a note in the comment form below or tag your photos with @peasandcrayons on Instagram so I can happy dance over your creation! I can’t wait to see what you whip up! Can’t wait to try these. I would love it if there was a calorie count, even it was a rough estimation!